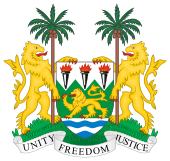 This is a list of heads of government of Sierra Leone, from the establishment of the office of Chief Minister in 1954 until the present day. The office of Prime Minister was abolished after the constitutional referendum in 1978, and reinstated in 2018 with the appointment of David J. Francis as Chief Minister. This page was last edited on 11 April 2019, at 08:36 (UTC).